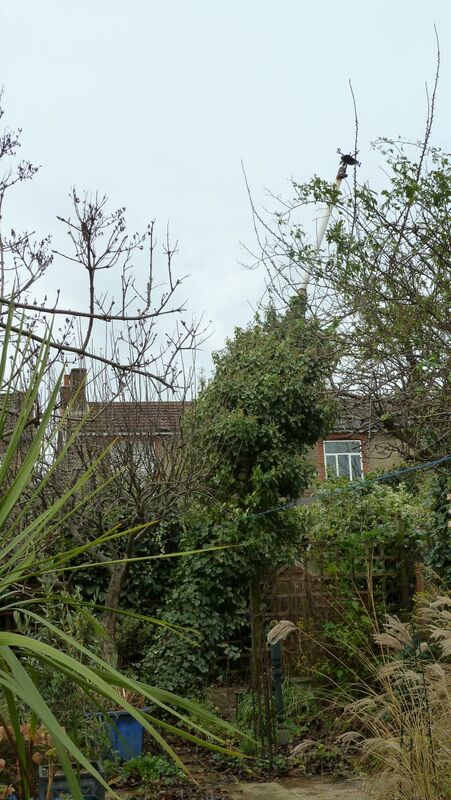 When D and I bought this house, one of the things that was rather quirky about it (it’s otherwise a rather ordinary Victorian house in East London – a generous size but nothing remarkable) was that we had a 30 foot high flagpole in the garden, courtesy of the last owner of the house. We’ve never flown a flag on it, but we did love the weathervane on the top and it made a grand support for a venerable ivy that had stems as thick as tree branches and where half a dozen birds nested every spring. The flagpole was rather a landmark as you approached the house and turned into the streets around us. My plans for Christmas Eve had been to partake of a leisurely breakfast, walk the dog, post Christmas greetings to you all, potter around while waiting for the Muppet Christmas Carol to come on TV (my favourite version, definitely), walk the dog again, take Mum across to my sister’s, enjoy a good supper with family… all the sorts of things you want for Christmas Eve. 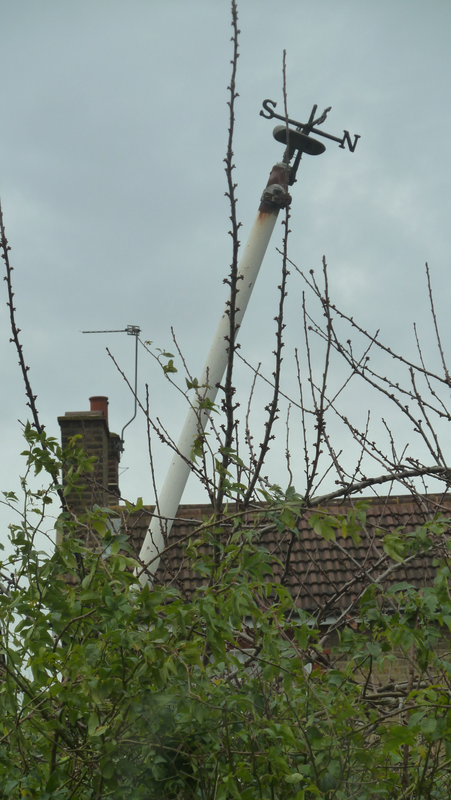 Instead D and I spent the day moving huge plant pots around and hauling flagpoles down to the ground – we had to go and buy the ropes first – tugging it out of the cherry tree and lowering it down. Surprisingly, it did actually come down slowly and under control, thanks to our neighbour hanging onto a rope at the back and slowing its descent. 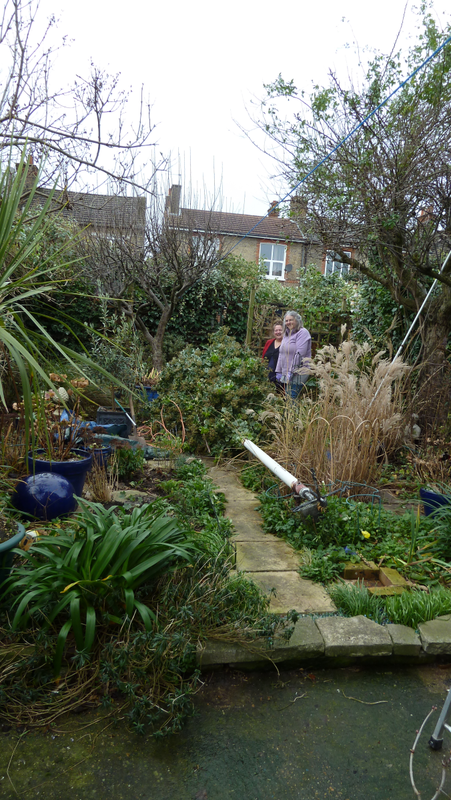 The next few hours – mostly in spitting rain – was spent hacking away the ivy (7 large bin bags full and we still didn’t finish) and repotting my poor broken lollipop holly tree. I was soaked to the skin and my hands so wet and cold, that when I came and started warming them, they were tingling and red and felt like they belonged to someone else. We didn’t have time today to actually do anything with the flagpole which is now lying the full length of my garden. It will have to stay there until the new year, I think, when D will attack it with an angle grinder and cut it into lengths that we can manage to move to the local dump for recycling. We didn’t have time to got to my sister’s, but instead they came and collected mum and headed home again within ten minutes. I don’t blame them. No one sane wants to be on the M25 on Christmas Eve. It’s manic. I don’t feel very Christmassy. I really feel like I’ve been hit by a truck and then the driver came around in a circle and did it again. I ache in places I’d rather not think about. But I am about to go downstairs and have an indulgent supper of baked beans on toast (grins) washed down with champagne and followed by a very sinful chocolate dessert. And then I’ll read A Christmas Carol, which has been my habit on Christmas Eve for probably more years than some of you have been alive. I love that story, even though I usually hate Dickens’ depiction of children and am tempted to brain Tiny Tim with his own crutch. Scrooge makes up for Tiny Tim’s imperfections. So. Deep breath. At the end of the day, I am minus my quirky flagpole and the garden will take one helluva lot of clearing up, but no one was hurt and nothing serious was damaged. I can thank Him Upstairs for that, I suppose, even as I wonder at His decision to blow hard winds upon us in the first place. Time to forget the troubles and have a merry Christmas. I hope that yours is all you could wish for and that you have a happy and merry holiday. Next Publish? Or be damned? I’m glad you’re safe, but what a way to spend Christmas Eve! I can relate a little, having had to spend part of this morning removing a rotten fence panel from where it had blown onto my fence and balanced there in a way that looked distinctly dangerous to life and limb. Thankfully the only thing damaged was my manicure. I hope you have a lovely Christmas. Sorry to be so dilatory about replying. We went out of London for a few days immediately after Christmas and I’m still trying to catch up. Christmas was lovely, thank you, and I hope yours was too. All the best for 2014! Good gracious! I’m glad no one was injured. We didn’t have wind, just three inches of rain which made life interesting, since Russ wanted to go to the supermarket and get the ingredients to make biscuits. Hugs to D, and I hope you guys have a lovely Christmas! Hugs back at you, Val. Sorry to be so slow to reply, but we were with friends in the country immediately after Christmas day and I’m still in catch up mode here! I hope you and Russ had a great Christmas, that the biscuits turned out well, and that you both have a happy and healthy 2014. Happy Christmas! Maybe you’ll have a more relaxing new year. Shame about the flagpole, though. Grins. 2014 so far has been frantic, but I hope it will slow down a little next week and let me catch my breath. I spent much of it so far proofing a friend’s novel and now must turn to my own work. I’m missing the flagpole. I loved the weathervane on top, but it isn’t at all salvageable, sadly, and we’re in the process of cutting it into manageable pieces so we can cart it to the local dump. I’ll miss the weathervane. All the very best for the coming year!